While President Bush has proposed an ambitious second-term agenda, it is Senate majority leader Bill Frist who has the responsibility to make it happen. Frist has had some early success corralling the independent-minded egos of the Senate, passing long-sought class action and bankruptcy legislation. But things will only get more complicated from here, with issues like reforming the Social Security system, changing the tax code and clearing conservatives for posts on the Supreme Court and U.S. circuit courts still ahead of him. Achieving those goals is important to Fristbut staying out of trouble while doing so is just as critical. Many expect Frist to make a run for the White House in 2008, and staying true to his conservative base while not making any campaign-killing gaffes will be a challenge. Frist remains coy about his ambitions, but in March alone he made two trips to the crucial G.O.P. primary state of New Hampshire, working the room at senior centers and a Republican dinner. He has said he won't seek re-election in 2006, leaving him free to campaign full time for the G.O.P. nomination. Frist, 53, has a lot going for him. After his 1994 election, the heart surgeon from Tennessee became the first physician in the Senate in 50 years. But recent political losseslike his clumsy handling of the Terri Schiavo caseleave him a long way from presidential stature. His name recognition is slim. His polling numbers trail far behind Arizona Senator John McCain's and former New York City mayor Rudy Giuliani's. And while Frist has frequently traveled abroad (sometimes to the chagrin of colleagues who would prefer he spent his energies in the chamber), he lacks real national-security or foreign-affairs credibility. As Bob Dole learned in 1996, running for the White House while running the world's most deliberative body is a daunting task. 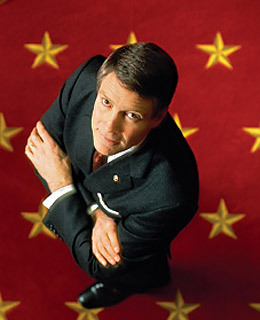 Bush's Cool Operator: Bill Frist is the President's crafty Senate warrior with much on the line. Can the G.O.P. leader deliver?